We believe in the same organization that existed in the Primitive Church . . . .
Yea, behold, I write unto all the ends of the earth; yea, unto you, twelve tribes of Israel, who shall be judged according to your works by the twelve whom Jesus chose to be his disciples in the land of Jerusalem. And I write also unto the remnant of this people, who shall also be judged by the twelve whom Jesus chose in this land; and they shall be judged by the other twelve whom Jesus chose in the land of Jerusalem. — Joseph Smith (from the Wentworth Letter, 1842; cf. History of the Church 4:538). Back during the ‘Primitive Church’ era, it appears that there were 24 apostles on the earth, organized into two separate quorums: the Twelve in the Old World (led by Peter) and the Twelve in the New World (led by Nephi3). While it is true that the New World Twelve were never specifically called apostles within the Book of Mormon (though see Mormon 9:19 and Ether 12:41, either or both of which could be referring to the New World Twelve as ‘apostles’) , Joseph Smith referred to them as such (as noted above), and Joseph Fielding Smith cautiously agreed. Mormon’s comments, cited above, indicate that the New World Twelve were subordinate to the Old World Twelve. In modern-day LDS parlance, we could refer to the Old World Apostles as the First Quorum of the Twelve, and to the New World Apostles as the Second Quorum of the Twelve. Nowadays, however, we only have the (one) Quorum of the Twelve. Given the 6th Article of Faith, the question comes up: what are the chances of the Church setting up a Second Quorum of the Twelve, as existed in the Primitive Church? And if the Church did so, how would it work, particularly given the tradition of succession in the modern Church? First, let’s see why the Church might organize the Second Quorum of the Twelve. When I joined the Church in 1967, Church membership was around 2.6 million, with about 450 stakes and 4,200 wards and branches. The large majority of that membership was in the Western United States, Western Canada, and northeastern Mexico. Apostles and even First Presidency members would visit stake conferences on a regular basis; I got to shake hands with Pres. Hugh B. Brown and Elder LeGrand Richards as a teenager that way. Back then, each bishop was set apart by an Apostle. Today, Church membership is approaching 14 million, with 2,800 stakes and nearly 25,000 wards and branches (roughly a 5x growth in all three categories). Over half of the Church membership lives outside of the United States. And we still have just twelve Apostles. The gap has been filled by the Presidents and Quorums of the Seventy (not to mention stake presidents). They really are the eyes and ears and legs and hands of the Apostles throughout the world. But the collective Seventy still have to feed into just twelve Apostles. I suspect that the members of the Quorum of the Twelve carry tremendous administrative, spiritual, and ministering burdens — and yet in all that, it is the core of their calling to be special witnesses of Christ. Imagine, then, how that burden would be lifted if there were a Second Quorum of the Twelve, another set of 12 Apostles among whom to share the load at that level of Church administration. Let’s follow the model in the meridian of time and assume that the Second Quorum of the Twelve is subordinate to the First Quorum of the Twelve. Seniority in the Second Quorum would work just like, but be independent of, the seniority in the First Quorum. There would be no automatic succession from the Second Quorum to the First; instead Apostles in the Second Quorum would be put on emeritus status when they reached 70 years of age. However, the Second Quorum would provide a fertile ground for candidates to fill vacancies in the First Quorum upon the death of an Apostle. In other words, it would work pretty much just like the Presidency of the Seventy works right now. In fact, I could argue that the Presidency of the Seventy fills the function of the Second Quorum of the Twelve, except that there’s only seven of them and they don’t have Apostolic authority (i.e., being sustained as prophets, seers, and revelators). As an alternative approach, what if the Church left the Presidency and Quorums of the Seventy just as they are now, but called an entirely new Second Quorum of the Twelve? This second Quorum could truly act as a “traveling presiding high council” throughout the Church, going as a quorum, in pairs or individually, to various parts of the world to help strengthen the church. In fact much as Elders Oaks and Holland did for a year in the Philippines and South America, respectively, members of the Second Quorum could live outside of the United States on a permanent or near-permanent basis, providing resident Apostolic authority throughout the world, while traveling back to Salt Lake on a regular basis to meet with the First Presidency and the First Quorum of the Twelve (though I suspect the Church would use two-way, satellite-based videoconferencing to reduce actual travel). Given this second approach, I suspect that the Second Quorum would largely comprise Apostles whose native language is something other than English and/or whose native country is outside of the United States and Canada. This approach would allow Church members throughout the world to hear in person from Apostles speaking their native tongues on a regular basis. At the same time, these worldwide Apostles could work more actively and directly with the governments of the countries over which they preside to help see to the Church’s interests in those countries. This approach would, I believe, tremendously strengthen the Church worldwide, especially in those areas (Latin America, Africa, the Philippines) where Church growth frequently outstrips the leadership pool. And for those keeping an eye on the Last Days, it would also ensure Apostolic authority distributed throughout the world in the event of major war and/or natural catastrophes. Interesting take on the Quorum of the 12 Apostles. My take on why there is only one Quorum of 12 is because they can reach the entire world, whereas in ancient times, there would have been no way for the Apostles of the New Testament times to communicate with the new world. Which begs the question, why couldn’t the Lord have them communicate through revelation? That in turn refers to who is called to a position. Prophets are called to speak to their people in there day. 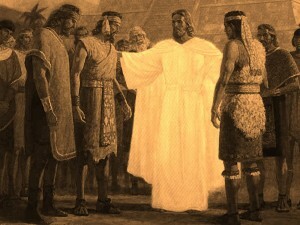 Nephite and Lamanite Culture was several hundred years removed from Israelite culture. A prophet and twelve disciples needed to be called because they could communicate directly with the Lord for the benefit of their people.